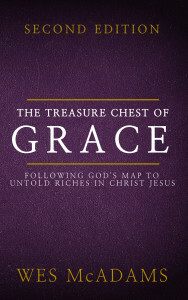 I am so excited to announce the release of The Treasure Chest of Grace. This book is all about how and when God saves man by grace. The only quotations in it come straight from the pages of Scripture, so you can be sure that the conclusions reached in this book are biblical! 1. I want Christians to know that they have not saved themselves! If you are saved, it is by the grace of God in Christ Jesus! When you were baptized into Christ, you did not save yourself–you appealed to God for salvation through Jesus Christ (1 Peter 3:21). I want Christians to know this and be able to explain it simply and clearly to others. 2. I want non-Christians to know exactly what they must do to receive the gift of grace in Christ Jesus. They need to know what grace is, why they need it, and how to get it! They need to know that their denominational preachers, pastors, priests, and popes may not have been telling them the truth about the grace of God. This book will lovingly explain to them the Truth! * Why being a “good” person isn’t enough. * Why faith is more than just believing in God. * Why God is in charge of who receives grace and how it is received. * Why some people are lost, who think they are saved. * Why the “sinner’s prayer” is not a biblical concept of how one receives grace. * Why hearing, believing, repenting, confessing, and being baptized are important issues when it comes to grace and salvation. It is my prayer that this book will motivate Christians to walk in grace and encourage lost souls to receive God’s gracious gift of salvation in Christ Jesus! 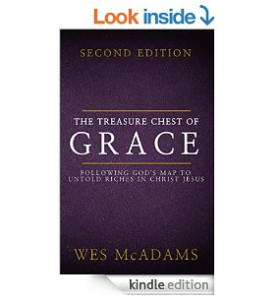 If you own a Kindle, or you own a mobile phone with the FREE Kindle app, you can download The Treasure Chest of Grace for only $2.99!